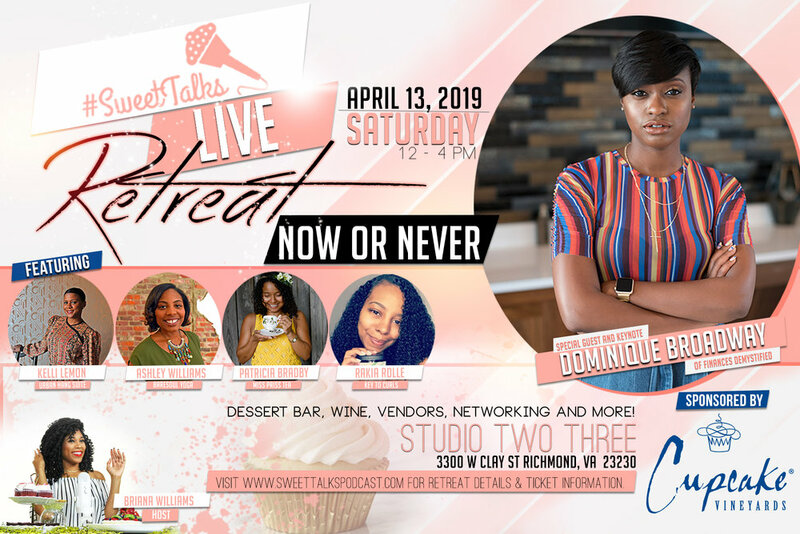 #SweetTalks Live Retreat is the premier event for women entrepreneurs of color looking to make their mark in the world and fulfill their purpose. Whether you already have your own business, organization, initiative, or you are still in the planning and idea phases and need a little direction and inspiration, this event is for you. This exclusive experience includes a unique live podcast interview with a phenomenal special guest and panel of women entrepreneurs, local desserts, an educational wine tasting, as well as vendors, entertainment, and so much more. In addition, a portion of the proceeds from the event will be given as a scholarship to one woman exemplifying a true entrepreneur. Why now or never? Frankly, because it’s time to stop pushing your dreams to the back burner and put in work in the kitchen to create your masterpiece and serve it to the world on a silver platter. Briana, also known as “Bri” is the Creator and Host of #SweetTalks, a podcast that gives listeners a tasty bite into the minds of delectable (phenomenal) women entrepreneurs of all flavors. After lifestyle blogging for 5 years, she decided it was time for a change. She had a litt’l talk with Jesus and the idea of #SweetTalks birthed from a place in which she refers to as #boldinsecurity. She LOVES DESSERT and wanted to create a podcast where women could listen to other women share their stories of life, whatever it may look like for them and how their journey has shaped them into who they are right now. #SweetTalks is a community for women entrepreneurs like myself who want to follow their dreams and may be searching for a better version of themselves with no fear of failing. Aside from the podcast, Bri has a full-time career in Marketing, Communications and PR and has worked the spectrum from corporate to nonprofit, working with some major brands nationwide. She’s planned multiple successful high-profile events and fundraisers for entertainers and professional athletes that even surprise her at times. Through it all, she have learned to never underestimate yourself. Kelli is a "Social Entrepreneur/Consultant" that is passionate about changing how people "LIVE" Richmond, Virginia. Formerly the Business Manager of Mama J's restaurant, Kelli is now working for herself (Like The Fruit, LLC) to socially connect people through food, sports, arts and education. She is an on air personality for Radio One Richmond's Kiss FM and iPower Richmond and hosts a weekly podcast and web series called "Coffee with Strangers". Kelli hosts various social events including The Richmond Jazz Festival, After Hours at The Virginia Museum of Fine Arts, Family Day at Lewis Ginter Botanical Gardens and Dinner En Blanc Richmond. She's also assisted in creating unique urban events in RVA including RVA Pop Up Parties, Hip Hop BINGO, Ready 2 Give Charity Events, Dinner and a DJ, HeART & Soul Brew Fest, Richmond Black Restaurant Week and The Art of Noise. 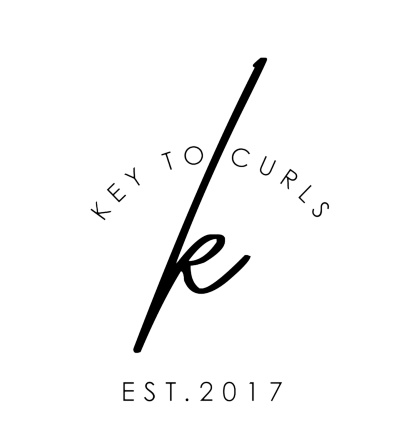 In 2018, Kelli blended all of her talents and opened her Urban Hang Suite concept in downtown Richmond. Kelli got her Bachelor of Science degree from UVA and Master's in Education from VCU. Ashley Williams is a Certified Yoga Therapist (C-IAYT) with 11 years of work experience within the field of education, mental health and juvenile justice in Central Virginia. She has implemented therapeutic interventions, programs and professional development trainings that combine mindfulness, movement, social-emotional learning techniques and mentoring in various settings including secondary schools, higher education institutions, detention and juvenile correctional centers, behavioral health programs, non-profits and adult education programs. Ashley is the Owner of bareSOUL Yoga & Wellness that offers daily yoga classes, private individual and group classes, educational workshops and yoga therapy sessions and other offerings that foster individual awareness, community building and holistic well-being. Ashley serves on the Board of Directors of Project Yoga Richmond, a technical assistant consultant for the Virginia Mentoring Partnership and a member of the Leadership Metro Richmond Class of 2019. In 2018, Ashley was recognized as Style Weekly's Top 40 Under 40 and Richmond Magazine's Daring Woman of 2017. Ashley lives in Church Hill, RVA and enjoys learning and exploring all parts of Richmond, Virginia. The tradition of afternoon tea has always been about bringing together friends and Patricia Bradby wants to foster friendships all across Central Virginia. Her tea party catering company, Miss Priss Tea, brings the elegance of a traditional Victorian tea to the location of your choice complete with finger sandwiches, miniature pastries, and scones with clotted cream. She started the business in April 2016 with the support of family and friends after moving back home to Richmond, VA. Her events and catering services bring together women of all ages to enjoy time away from digital distractions, learning from one another while finding comfort and relaxation in every cup. Patricia attended New York University for her undergraduate studies and received her M.B.A. from The University of Texas at Austin. 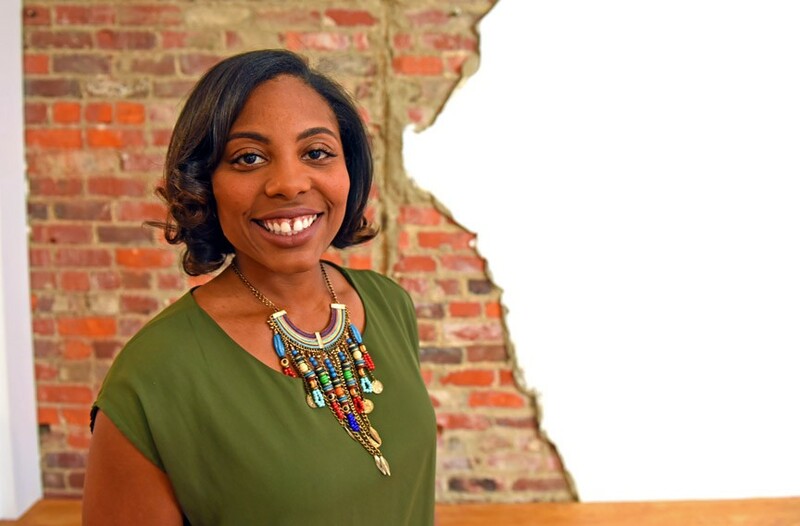 She has over 10 years of experience in marketing and event management, which she continues to pursue outside of her small business through her work with Leadership Metro Richmond and TEDxRVA. When she's not working you can find her hiking, biking, or dining around town, her three favorite methods of exploration. Korinn Y. Carter is a 27-year old serial and social entrepreneur from the North Side of Richmond, VA - she founds businesses and brands that promote positive social change in the Greater RVA area. She aims to be the ripple of change in her community by providing services, developing programs, and creating safe spaces for US by US. Korinn has been dedicated to the mission of developing youth since 2011, where she and a group of other goal-driven young women founded Chase Dreams Not Boys (CDNB), a student organization that grew to over 200 members among many universities. Currently, Korinn Y. Carter Enterprises, Inc. houses several small businesses that operate independently and employ over 15 staff collectively. Korinn’s passion to build up and provide support to other entrepreneurs (especially women!) has led her to open The Glow Shop - which is not only an inviting salon that offers an array of beauty services, but where she offers business and branding coaching to each #GLOWPro, or beauty professional, that joins the team. In addition, Korinn curates unique events, coaches other entrepreneurs to realize their visions, and provides creative brand direction for other businesses and brands. Throughout the years, she has been recognized across a variety of platforms. In 2017, Korinn was listed as one of Radio One iPower92’s Inaugural 30 Under 30 honorees for making a positive impact in the community. She believes that “Little girls with dreams become women with vision” and she takes pride in being just that - a woman with a vision to change the world, she’s just starting with hers first. our official hotel sponsor is the graduate richmond hotel located at 301 W Franklin St, Richmond, VA 23220. Unique offerings include: Our seasonal Byrd House Bar located on our 16th floor roof-top, complimentary bicycle rentals, in-room refrigerators, Brookfield Cafe and Lounge with outdoor patio on our first floor, roof-top outdoor seasonal pool, fitness center and complimentary wi-fi throughout. Please note we do offer valet only parking at $15.00 per car per day with in/out privileges. Our Platinum Sponsor, Cupcake Vineyards is known for their assorted collections of finely-crafted wines that pair perfectly with moments of joy. Thanks to them, our guests will enjoy many of their popular wines including Moscato D’asti, Rosé, and prosecco in an educational wine tasting – all that can be sampledwith delicious treats from our dessert bar. Our Sponsor, Sonabank P.O.W.E.R., will have representatives on-site to answer financial service questions for all women entrepreneurs in attendance! Come and enjoy incredible desserts such as specialty flavored and infused cupcakes, chocolate covered strawberries, and more from one of our favorite sponsors, The Sweetest Thing RVA! Let’s get our mind, body, and spirits relaxed and focused to connect with others and learn from everyone at the retreat with a little mediation and breathing exercise to kick things off, thanks to our sponsor BareSOUL Yoga. Tea anyone? Let’s just say you may be leaving with a little more than you came with…perhaps a specialty tea blend to try at home, thanks to Miss Priss Tea! The #sweettalks live retreat is made possible by our amazing sponsors and partners.If you are interested in being a sponsor, please contact us at info@sweettalkspodcast.com. Shop & connect with businesses that support women of color. if interested in being a vendor, please contact info@sweettalkspodcast.com. You must be at least 18 years old to attend the event. Wine will be served to those 21 years old and above and an I.D. is required. There is plenty of parking (both in a lot and street parking), but feel free to take an Uber or Lyft if you prefer! If you are coming with friends, carpooling always helps! Casual chic. Show your personality. Bring yourself, of course – business cards, and maybe an extra pen and paper to take some notes. Leave all distractions at home! Yes, your ticket is transferable to another individual within 2 weeks of the event date. Please either have a printed ticket or the app available, along with your I.D. There are no refunds for the event, but tickets can be transferred within 2 weeks of the event date to another individual attending. Make sure to register the ticket for the person who will be attending. Email info@sweettalkspodcast.com with any further questions. Check our latest grams and everything#SweetTalksLIVE!